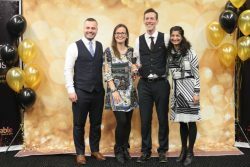 The 2018 Active Wandsworth Awards took place on Friday 22 February recognising the commitment and achievement of the many people involved in sport and physical activity within Wandsworth. Awards were presented by England Footballer Fara Williams and GB Katie Snowden. The evening saw England and Harlequins prop Kyle Sinckler claim the Sport Person of the Year prize with talented Waterskier Molly Lee winning the Junior Sports Person of the Year. Volunteers were recognised for their work in the community with Rachel Denning of Battersea Ironsides RFC becoming Volunteer of the Year and Nicolas Flores Pujols Young Volunteer of the Year for his work at Southfields Academies Basketball Academy. The fantastic girls from Burntwood School won the Mayor’s Award for raising the profile of Disability Sport within their school and locally in the community. Simon Haspal was awarded the Outstanding Contribution to Sport & Physical Activity trophy for his dedication as fixtures secretary at Wayfarers Hockey Club. Broadwater Primary won the newly introduced Active School of the Year for their work in encouraging all pupils to be active through a range of clubs and initiatives. Balham Football Club won Sports Club of the Year and Leonard Cheshire scooped the Physical Activity Project of the Year award for their continued work with Adults with a disability.